Winnie Couture is a high-end attire brand with a modern mix of classic elegant and sophisticated couture. It blends femininity and luxury to create bridal attire silhouettes that are flattering and timeless. Altress is innovating bridesmaid dresses! Brides select length and color, and have your favorite ladies design dresses that they will love to re-wear! They will thank you for it! Bella Bridesmaids NYC provides a chic collection of bridesmaid dresses from today's leading designers including Amsale, Jenny Yoo, Monique Lhuillier, Hayley Paige, TwoBirds, Dessy, Theia, Adrianna Papell, Watters and Joanna August. Bella Bridesmaids loves a wedding! We have the largest collection of bridesmaid dresses from the world’s leading designers in our Bella Showrooms. Since 2001, Designer Loft has featured top and emerging bridal designers. Our gowns reflect a variety of tastes, sizes and styles, celebrating the diversity of our brides. Service is what makes us different! Custom build ups and alterations on site. Ranked top salon Manhattan by The Knot, Brides.com, Time Out New York, Grace Ormonde Wedding Style. West LA bridal shop with a broad selection of effortlessly chic and romantic dresses. We are differentiated by our no-pressure fun styling sessions and exemplary customer care! Come see us! Glamour Closet is the industry’s largest dedicated designer outlet for wedding gown samples. Glamour Closet has locations in New York, San Francisco, Los Angeles and Chicago. Redefining Brides and Bridesmaids. Our philosophy is to present you with a collection of dresses incorporating rich and luxurious fabrics to create an elegant, feminine, and refined look. Madame Paulette’s professional cleaning and preservation services, along with gloves for handling and free US shipping. Professional cleaning, repairs and storage in museum-quality, acid-free archival boxes are vital to a gown’s longevity for preservation as an heirloom. Celebrity designer Oliver Tolentino specializes in women’s couture, including his first love: bridal gowns. He entertains custom bridal appointments at his ready-to-wear boutique on Robertson Blvd in Beverly Hills, California. 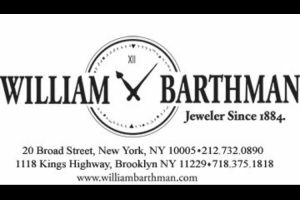 William Barthman is a renowned retailer of the world's finest watches and jewelry since 1884.